Tucked away in the historic Hall Campus Center of the University of Lynchburg, President Kenneth Garren reminisced of his friendship with the late Dr. Jerry Falwell Sr., founder and former chancellor of Liberty University. MEMORY — Garren received an autographed copy of Falwell Sr.’s autobiography in 2003. Falwell Sr. took Garren to the Jerry Falwell Museum and shared with him about his life. 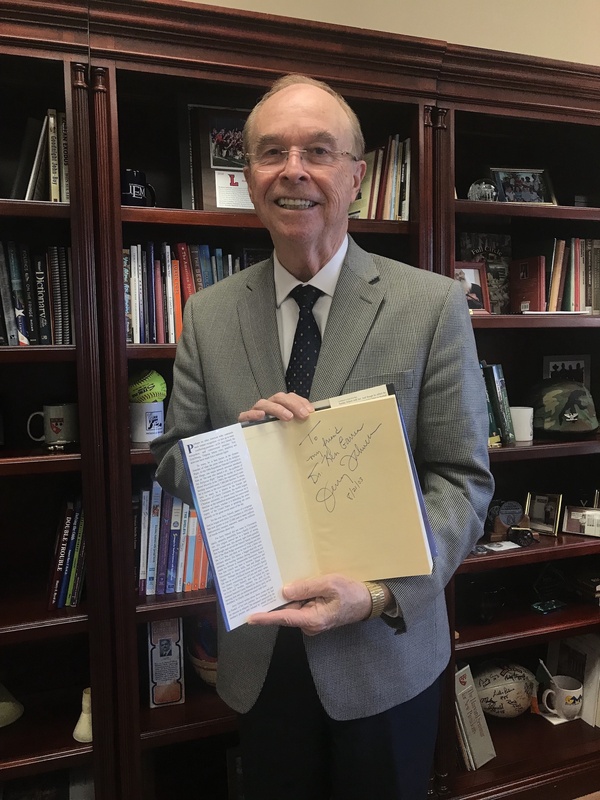 The two bonded immediately, and Falwell Sr. gifted Garren with an autographed copy of his autobiography, which Garren keeps in his office, along with other memorabilia from his friendship with Liberty. “To my friend, Dr. Ken Garren,” Falwell Sr. wrote in the front cover of the book. Garren said the encounter was the “beginning of the relationship” between the University of Lynchburg and Liberty University under his presidency. Therefore, it should have come as no surprise when Liberty donated to the University of Lynchburg in August 2018 a land and cash gift valued at $1 million in honor of the late Jerry Falwell Sr. The donation consisted of a parking lot valued at $750,000 and a $250,000 check to aid the construction of the University of Lynchburg’s new residence hall, which is slated for completion in August of 2019. “We were trying to figure out what to do with parking, and when Jerry (donated the property), I said, ‘Oh my gosh, that’s a huge thing! That’s really nice of you,’” Garren said. The parking lot — a former TRBC overflow parking lot — is adjacent to the University of Lynchburg’s campus and will help alleviate parking congestion on the main campus. The $250,000 donation will go toward a new residence hall, which will house about 270 students, according to a press release from the University of Lynchburg. A portion of the residence hall will be named in honor of Jerry Falwell Sr. While Garren and Falwell Sr. fostered both a friendship and a healthy relationship between the two universities, Garren has also made an impact on Jerry Falwell Jr., Falwell Sr.’s eldest son who became Liberty’s president after his father’s passing. 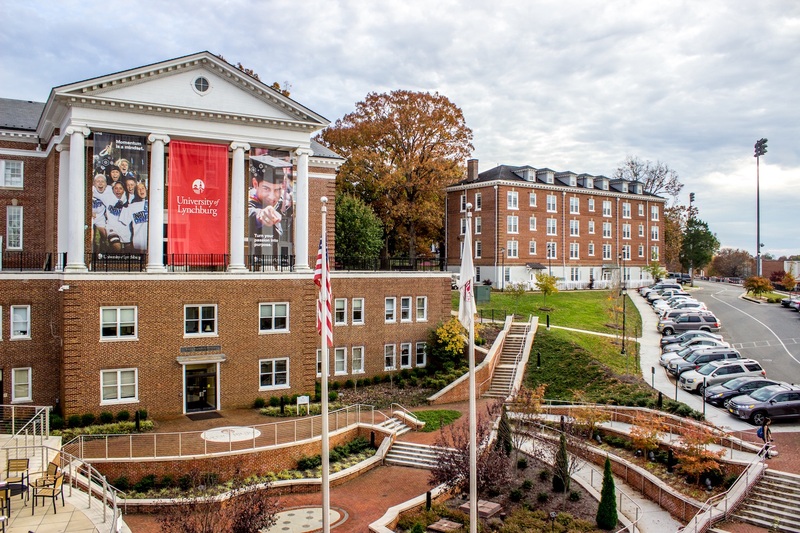 CAMPUS — In 2018, Lynchburg College was renamed to the University of Lynchburg. Garren agreed with Falwell Jr.’s sentiments of friendship and reminisced of the early stages in their relationship. When Falwell Sr. passed away in 2007, Garren and Falwell Jr. shared many conversations about their work as college presidents. Garren explained that their friendship “developed naturally,” and he thinks fondly of both of Liberty’s presidents. Though both universities are private, Christian colleges, as the University of Lynchburg is affiliated with the Christian Church, both Falwell Jr. and Garren said there is little rivalry between the two schools. Liberty offers some programs that the University of Lynchburg does not and vice versa. When the University of Lynchburg first introduced its Doctor of Physical Therapy program, Garren approached Falwell and asked if he would consider developing other health science programs rather than a Doctor of Physical Therapy program, as a limited number of physical therapy internships were available in the area. While much of the relationship between the two universities lies with the executive powers, Garren explained that students also engage with each other on occasion. “Our basketball teams played each other one year over at Liberty, and we were soundly trounced,” Garren said with a laugh. Garren also explained that the University of Lynchburg’s track team conducted meets at Liberty while the Hornets’ track was under construction. Additionally, some of Lynchburg’s professors have taught at both universities, and some students have taken courses at both schools. Music ensembles have even borrowed musicians from Liberty’s school of music from time to time. Two of the greatest leaders in the country at two of the best schools in the country. Thank you both for your shining example and all that you do for Lynchbrug!